ROCK VETERANS: Colin Mockett journeys back to the 1950s with band All Shook Up. 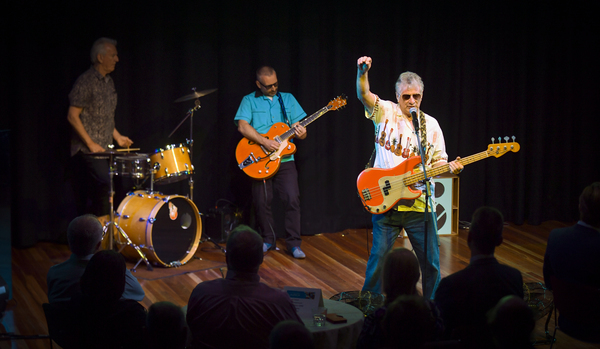 Veteran Hamlyn Heights musician Colin Mockett hopes to have locals jiving, boogying and bopping through time in The History of Rock n’ Roll next month. “We take you back to Memphis in the 1950s (and) we leave it with the Beatles,” the long-time musician and historian said. Mockett said his band, All Shook Up, would being begin the journey in the segregation era, when record producer Sam Phillips discovered Elvis Presley. “(He) said if he ever found a white man who could sing black music he would make a fortune, and he did!” he said. Mockett narrates the pivotal moments of rock and roll between sets in the show, which combines his dual loves of history and music. “It’s a joy for me. This is pure pleasure to put to together,“ he said. Along with Elvis, All Shook Up will play hits by Jerry Lee Lewis, Chuck Berry, Johnny Cash and more when the cover band comes to the Potato Shed on 5 March. For 18 years Mockett has performed similar shows drawing mostly “people who were around in the ’50s or ’60s”, he said. But the “phenomenon” of Elvis often drew a younger crowd too despite The King being dead for 40 years, Mockett said.